Traditional Bathroom by Milwaukee Kitchen & Bath Remodelers timothyj kitchen & bath, inc.
Tuscan bathroom design is said to be a perfect combination of sheer indulgence and timeless beauty. When designing a bathroom, it is important to keep the style consistent with the rest of your house. It is a fabulous idea to decorate your bathroom in a luxurious Tuscan design with scrolled ironwork, ceramic tiles and marble if you have Mediterranean or Tuscan elements as your home decor. A Tuscan master bath would be beautiful, to accent your Tuscan style bedroom. For a Tuscan bathroom design, choosing the right wall color will set the feel for your Tuscan bath. Just as with standard Tuscan decor , warm colors are ideal. 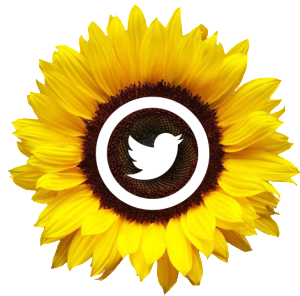 Selecting colors with a yellow base will give you a solid platform to work with. Terra cotta and gold colors are common in Tuscan design. A useful tip to remember is choose the light color as the base, and think of adding a darker shade on top with sponge or stucco texture. Consider color washing and applying faux wall techniques. This adds a rustic, Old World charm to your space. An easy way to put together a color palette that makes sense with your Tuscan bathroom design is by looking for an Italian piece that catches your eye. Often a beautiful painting or piece of Italian tile will have a great combination of color. Pull out the colors to accent around your space. Integrating darker colors such as burgundy, olive green or deep blue are perfect choice for creating a Tuscany spa. Again, look for these types of colors in your tile piece when selecting your palette. More than likely, they will be there. 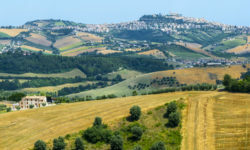 A beautiful picture from your trip to Tuscany is a wonderful addition of Tuscan Art to your bath. Have a couple blown up in a copy shop to canvas. This can also assist you greatly in choosing your color palette. This works wonders in a large or small Tuscan bathroom. The key to a beautiful Tuscan bath is how you accessorize. 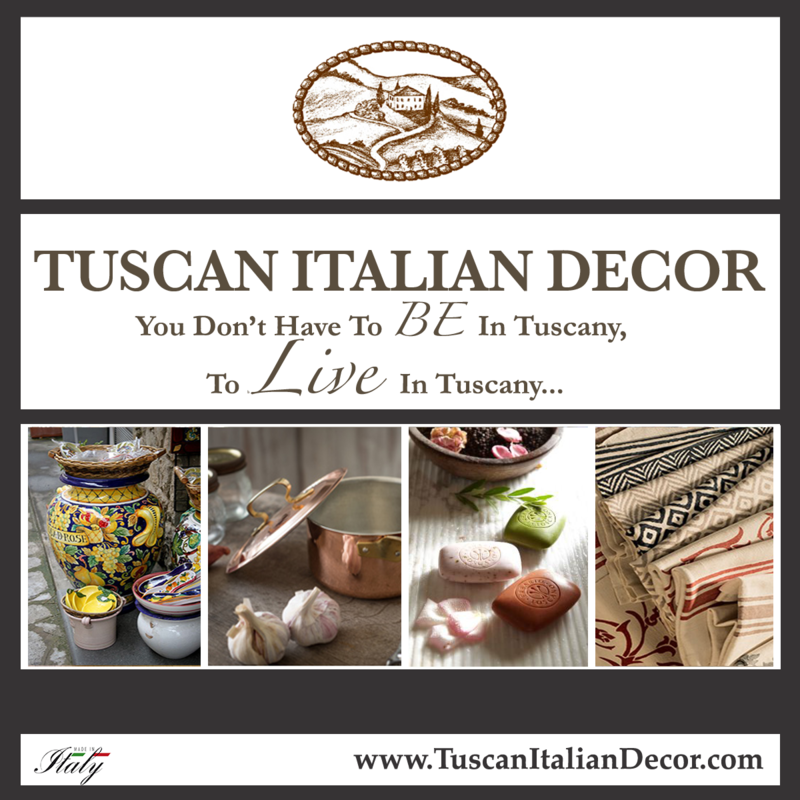 Keep in mind the Old World style when choosing your Tuscan decor accessories and you will achieve the look and feel you are after. Your bathroom vanity, sink and accessories will set the tone of your Tuscan space. Considering items like Metal urns, lots of greenery, Terra cotta pots, wrought iron sconces and candle holders, and glass apothecary jars are appropriate for Tuscan master bathrooms. You can just imagine how much you will be able to find. 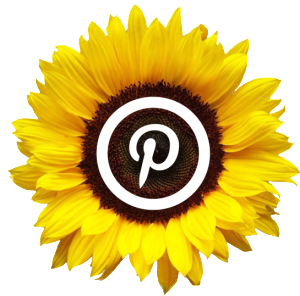 Consider hanging a wrought iron shelf as well. Open bathroom shelving is consistent with Tuscan design. Carefully select your Tuscany faucet. There’s so much that can work in this type of bathroom. You want the style you prefer, and the price you can afford. Keep that in mind. You can get creative by placing a baroque towel stand next to your bathtub, or a wrought iron vanity if you have space. There are stores that you can shop online that carry Tuscan decor, where you can find terrific things like a beautiful Tuscan fabric shower curtain. Products like these are great if you have only a shower in your bathroom. If you have a budget to work with, choose some marble or tile for flooring that will fit well with your Tuscan bathroom cabinets. A beautiful rich color on the floor with take your Tuscany spa to a much higher level! If marble or stone flooring is too pricey, you definitely can bring out stone by adding stone details like a travertine soap dish and dispensers. Even marble candlesticks will introduce rustic materials appropriately. 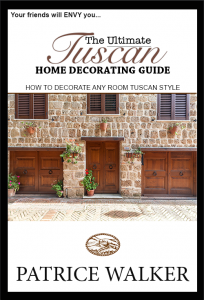 I will teach you step by step how to decorate any room in your home Tuscan style, any budget. Create a genuine Tuscan ambiance utilizing today’s Tuscan design techniques. Bathroom, Kitchen, Lighting, Bedroom….Learn how to pick your flooring, accessories and more. Tons of Tuscan bathroom decorating ideas. 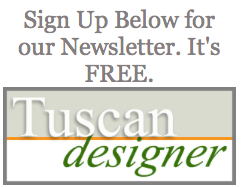 Subscribe To Our Free Newsletter for more Tuscan Decorating Ideas for Bathrooms! 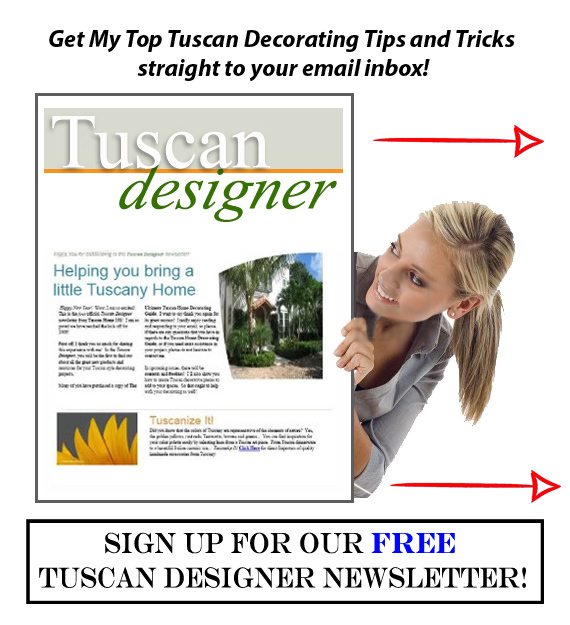 Tuscan Designer provides up to date, easy and affordable Tuscan decor ideas, subscribe to our newsletter. Here you will get first dibs on new Tuscan decorating techniques. Also, you will be the first to know every time The Ultimate Tuscan Home Decorating Guide free upgrades are available! Click Here for more Tuscan bathroom ideas and to subscribe Now!